Malta MEP Miriam Dalli speaks at the workshop. There is an urgent need within Europe to address the root cause of migrants at sea and the European Union needs to adopt a more proactive approach in preventing this human tragedy getting any worse. 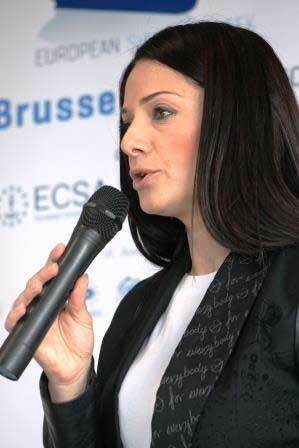 Addressing a Brussels workshop on the issue of large scale rescues at sea, organised by InterManager in association with the European Community Shipowners' Associations (ECSA), Malta MEP Miriam Dalli (pictured) said that Europe and the international community needed to focus more on preventing the problem. She told delegates: "I refer to the recently published EU Maritime Security Strategy which recognises that people undertaking such journeys are not criminals but those that exploit their needs are embroiled in criminal activities. The Strategy establishes a framework to tackle smuggling of migrants and trafficking in human beings and this can be done by developing security building programmes with third countries with a focus on priority countries and also routes. "This is a preventative measure which can take matters in the right direction but which can only be achieved when a government structure is established within the respective third states," she said. The legal obligation of a ship's Master to render assistance at sea is recognised by international law and it is qualified by the UN Convention on the law of the sea, SOLAS, and is also found in the SAR Convention, she told delegates. "Assistance at sea by ships' crew has been a long-standing humanitarian maritime tradition and we all need to appreciate and recognise the efforts being carried out by seafarers and ship management companies to save lives at sea. "But beyond the legal framework and its implementation, we definitely need to establish concrete actions primarily on issues like the human tragedy and to address the challenges being faced by all of those involved. Merchant ships have played and should continue to play a very important role in saving life at sea as they form an integral part of the dedicated search and rescue service provided by coastal states. "Migrants and refugees travelling by sea is not a new phenomenon: migration has been in existence for centuries and only global peace and global political stability will diminish the migration levels we are seeing today. "But this problem is not just happening in the Mediterranean and is not a regional problem, but is a global issue which should be considered on a global level. And within the international fora, new member states should be instrumental in driving the international community to take action within the established legal framework," she said. The workshop, held as part of European Shipping Week, aimed to shine a spotlight on the problems faced by merchant vessels when rescuing large numbers of migrants adrift at sea. The meeting helped shipping companies better understand and evaluate the challenges involved in carrying out such humanitarian operations and featured presentations on EU migration policy, ship security and rescue guidance, as well as hearing testimonials from shipowners and ship managers whose vessels have carried out such operations. Captain Kuba Szymanski, Secretary General of InterManager, said: "This was an important opportunity to share best practice and together consider the challenges faced by our vessels when coming to the aid of large numbers of people in danger at sea." �	The need for the General Public to be aware of the excellent job the shipping industry is doing in providing help and assistance to those in danger at sea.